The presidential family of the United States is now experiencing convulsive times and not precisely because of the policies they are carrying out, but once again for the most private plot of their lives. This time, the focus is on the son of President Donald Trump, Donald Junior, who may be about to sign the divorce papers of his wife, Vanessa Haydon, as they say from various US media. 13 years of relationship and five children in common are the fruits of their marriage. 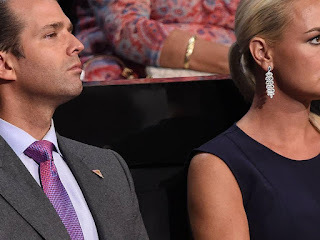 A relationship that could be going through its worst moment, although from 'Page Six' it is stated that this situation is not new and does not surprise the members of the clan: "Donald Jr. and Vanessa are going through a crisis for a long time, but when Donald Trump won the elections they decided to remain united throughout his term. But every time they find it more difficult to solve their problems, because he is never at home," says a source close to the marriage consulted by the aforementioned media. It was in 2005 when the couple decided to go through the vicar, uniting their ways with the promise of an eternal love. However, the routine has made a dent in their commitment, and for some months now their relationship has been watered down to the point where they almost do not live as married. "Donald Jr. has been busy traveling, which has led to the problems between them increasing. Vanessa is a devoted mother, but every time she feels more alone and she is the one in charge of the children ". Since Vanessa Haydon became part of the Trump family, she has chosen to occupy a low public profile and get away from the scandals that her political family leads almost weekly. "She is by nature a very discreet person and does not feel comfortable with the attention her family is receiving now that they are on the world stage. She is also worried about her children, especially since she received the letter that contained the white powder. “Although it was not anthrax, as was believed at first, and the content of the letter was not dangerous to health, in the end Vanessa had to receive medical attention, although it was not possible to specify the specific reason, but it is believed that it was for the fear he felt after opening it and fearing for the life of his family.